FUTEC has proudly announced a key milestone, the installation of its 10,000th system at Schröder Design Verpackung GmbH, Germany. 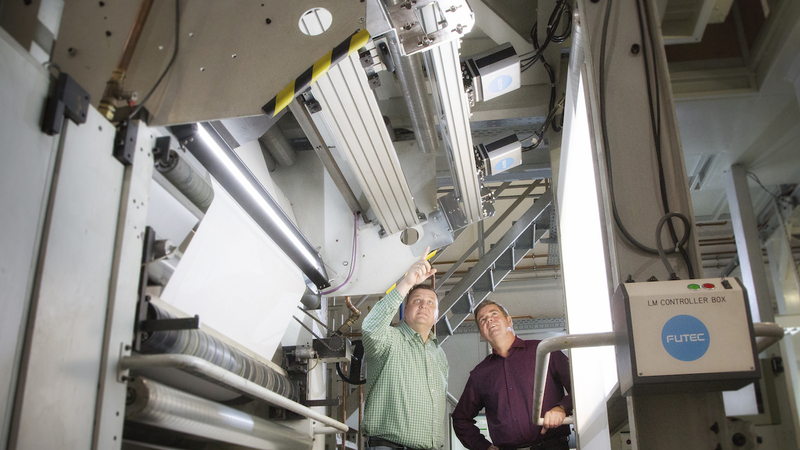 This Saxony-based flexo printer and converter boasts customers such as Lufthansa, major German football teams, tissue manufacturers and online traders. Continuing its momentum in the EMEA region and commitment to flexo printers, FUTEC is also announcing the first machine learning solutions for fault detection, representing the next generation of quality control specifically for flexo printing machines. Established 28 years ago, Schröder Design Verpackung operates in the highly competitive flexo packaging market, predominantly producing semi-final products with reel-to-reel operation. It manufactures film rolls with variable widths and thicknesses, with and without micro- and macroperforation. In addition, it produces printed and unprinted silk papers of different quality levels, and branded film bags. Schröder’s newly installed FUTEC system – the 10,000th FUTEC system installed worldwide – will operate on an 8 colour CI flexo press. FUTEC’s hardware-based image processing solution offers the highest processing speed available on the market. It enables the real-time availability of large amounts of inspection data. Now, using sophisticated algorithms to intelligently analyse and interpret the data, FUTEC can bring significant improvements and efficiencies in key areas for flexo printers: splice detection, pressure control, and CI drum inspection. FUTEC software enables patterns to be identified in real-time, and the system is able to quickly and clearly distinguish between a printing defect and a machine defect. With Industry 4.0 in mind, these new benefits enable swift troubleshooting as well as avoiding unnecessary disruptions in production, therefore helping printers transform their businesses. These new machine learning capabilities will be available from FUTEC later in 2018. Visit FUTEC at the Hispack tradeshow, 8-11 May 2018, Barcelona, Pavilion 2, Level 0, G Street, Stand 744.